Baby bath tubs are one of the many considerations you or loved ones will have when shopping for a new baby. 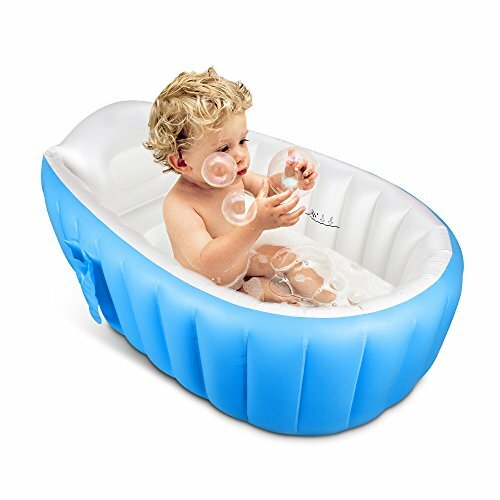 Having the best baby bath tub is important because babies become very slippery when soapy and wet and it is very difficult to support a newborn’s head and body while washing them at the same time. Baby tubs are designed to assist you in this nerve-wracking process by holding your baby and making bath time easier and more enjoyable. We’ve compiled a list of the top ten best baby bath tubs along with their best and worst features to help you choose the right one for you. Size: will you be giving baby a bath in the tub, on the floor, or in the sink? This baby bath tub is a higher end tub and loaded with features. 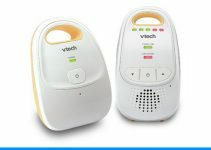 It is suitable for ages newborn through toddler. It contains a simple one-piece design with no loose parts and comes with an added mesh sling for newborns. The mesh sling and attached padded head rest are both made of mildew-resistant materials. The tub itself has two adjustable positions: a reclined angle for infants who cannot yet sit up but are too big for the sling, as well as a flat position for older babies and toddlers who are fully capable of sitting upright. The base of this tub is slip-resistant. 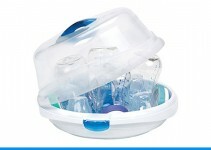 In addition, it also contains a drain for easy cleanup and folds completely flat for storage. There is also a built-in hook that can be used to hang the tub up to dry. The only major disadvantages to this tub are the size and color schemes. The tub is on the larger side and will only fit in bath tubs so it may not be ideal for parents who were hoping to bathe baby in the sink. In addition, there are two color schemes available: blue and green; and red and blue. The two schemes veer slightly towards boyish and may disappoint parents who were hoping for a tub with pinks or purples for little girls. This baby tub is quite unique. It takes on a more cylindrical shape as opposed to most other baby bath tubs that are rectangular. The Shnuggle is very lightweight and compact. It uses only 2 liters of water to fill and weighs only 7.3 lbs when full. The compact size and cylindrical shape allow for it to be used in the tub, in most kitchen sinks, and even on the floor. The slip-resistant feet prevent it from sliding on surfaces. 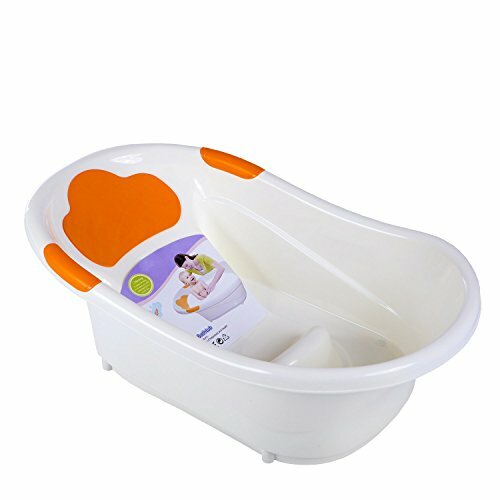 The recommended ages for this tub is newborn to 12 months. There is a soft foam backrest along with a special “bum bump” that prevents babies from slipping and holds even newborns ergonomically in place. This tub advertises hands-free bathing due to the angle of the backrest and bum bump. This is a big deal because many moms will tell you that even the most supportive bath tubs require a steady hand to hold a squirming baby in place. In addition, this tub comes in three color schemes to appeal to everyone: gray and white; blue and white; or pink and white. This baby bath tub has no drain, which might be considered inconvenient for some. However, due to the lightweight and compact size of the tub, dumping it out shouldn’t be nearly as much of a hassle as it can be with other larger and heavier tubs. This type of tub is also very non-traditional and may make parents who prefer to stick to tried-and-true products a little nervous. This baby bath tub comes in three separate pieces to create height. 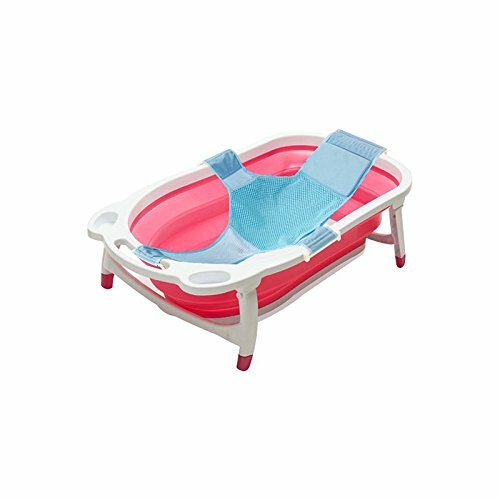 One piece is a bath support for newborns that has a foam backrest and bum cushion. The second piece is the tub that the newborn support goes in, and the third piece is the platform that the other two pieces sit on. As many seasoned moms will tell you, the hardest part about bathing a baby in the bathtub is the back pain that comes from leaning so far over the edge of the tub. This baby tub eliminates that by being tall enough so that mom doesn’t have to overextend herself when bathing the baby. In addition, when the pieces are separated, the platform piece can be used as a step-stool for older children. Some of the disadvantages of this tub include: bulky size, no drain, and only one color scheme. Due to the three pieces, this tub is quite bulky and may be difficult to store away when not in use. This tub also has no drain plug which requires the entire thing be lifted full of water and dumped out. Without water, this tub weighs in at 7.8 lbs. In addition, it only comes in one color scheme: blue, green, and white. This may disappoint parents who were looking for different color options. This baby bath tub is the most basic tub on this list. It consists of one solid piece with no removable parts or necessary assembly. It also contains a drain plug. This smooth design makes it very easy to clean. 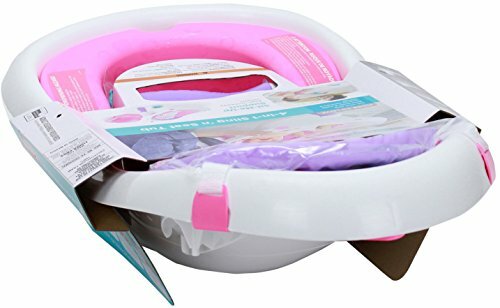 This Dream On Me tub also contains a non-slip base and headrest for baby’s safety, as well as a reclined shape with a bum bump to help hold baby in place. This tub is not suitable for newborns and is recommended for infants up to 12 months of age. It also has a weight limit of 25 lbs. This may be a major deal-breaker for parents looking for a tub that can be used for a longer period of time. In addition, this tub is quite large and will only fit in a bathtub. The bulky size may make storage a bit inconvenient for some as well. There is also only one color scheme available: green and white. The Boon Soak 3-stage bathtub has a very sleek and simple design with unique features. It is one piece with an adjustable baby bum bump suitable for ages newborn through 18 months. This tub is moderately sized but contains a contoured shape that allows it to fit in tubs, most kitchen sinks, and even over double-sinks. Both the adjustable bum bump and the backrest are made of non-slip foam. 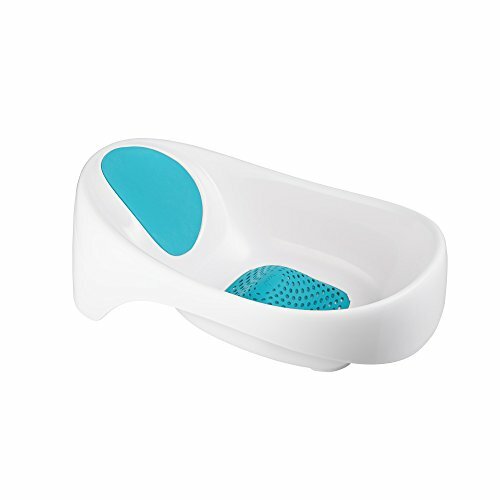 The tub also contains a color changing drain to gauge the ideal temperature for baby. This tub comes in two color schemes: blue and white; and gray and white. The only disadvantages this tub has over the others in this list are the fact that it has no hanging hook for drying and it does not fold for storage. This tub is adorably modeled after the famous book, The Very Hungry Caterpillar. It is one solid piece that comes with a mesh sling for newborns. One side of this tub is reclined for younger babies while the other side is shaped like a seat for sitting babies. It also comes with four caterpillar-themed stacking cup toys that can be used in the tub. This tub is moderately sized and fits in bathtubs but will also fit over double kitchen sinks. The drawback of this tub is the fact that it has no drain and does not fold or come apart for easy storage. The size of this tub also means it may not fit in many kitchen sinks that are not doubled. This Fisher-Price tub will be very appealing to little ones with its whale theme. This tub contains two pieces: an oval-shaped tub and a seat-shaped insert. The seat-shaped insert is adjustable to suit babies as they grow. 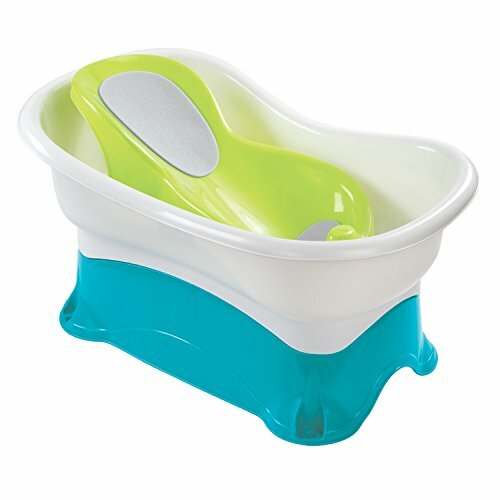 When added to the tub, it is perfectly suited for both newborns and older babies. The insert can also be removed entirely for toddler bathing. Not only does the seated insert contain non-slip padding, but the bottom of the tub does as well. This tub also comes with a drain plug for easy cleanup. It is a moderately sized tub that fits in all standard bathtubs and most kitchen sinks. The disadvantage to this tub is that it does not collapse for easy storage. Because the size is somewhat large, it’s important to check your sink’s measurements before purchasing if you intend to bathe your baby in the sink. In addition, this tub only comes in the one color scheme of the whale. However, the colors are teal and white and are reasonably gender-neutral. This tub is inflatable! It is suitable for ages 0-48 months, making this the broadest age-ranged tub on this list. 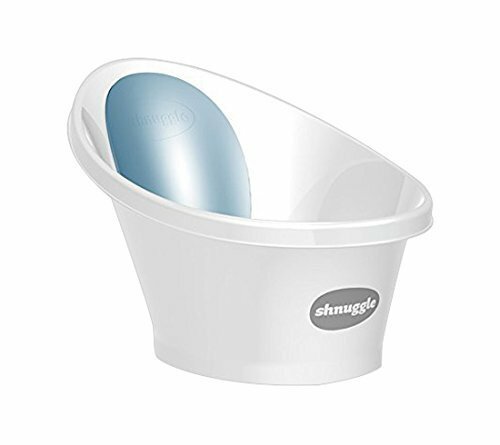 This tub contains a textured bottom to reduce the risk of slipping as well as a 45 degree angled position with a baby bump on one side of the tub for young babies. In addition, this inflatable tub also has a drain plug and an appropriate water level reminder line. This tub comes in two colors: pink and white or blue and white. This is an advantage if you know the gender of the baby but a major disadvantage if you were looking for something more gender-neutral. This tub also does not come with an air pump or a self-inflating mechanism: a separate air pump must be purchased. This is also the largest tub on this list measuring in at 35.43″ x 23.62″ x 11.81″. At this size, it won’t fit in any sink or standard bath tub and must be used on the floor. The fact that it is inflatable may be a great advantage or disadvantage depending on your preferences. On one hand, it is very compact and easy to store. On the other hand, it requires inflation before use. This 3-piece tub can be set up at four different stages for baby’s growth. It is suitable for ages newborn to toddler. 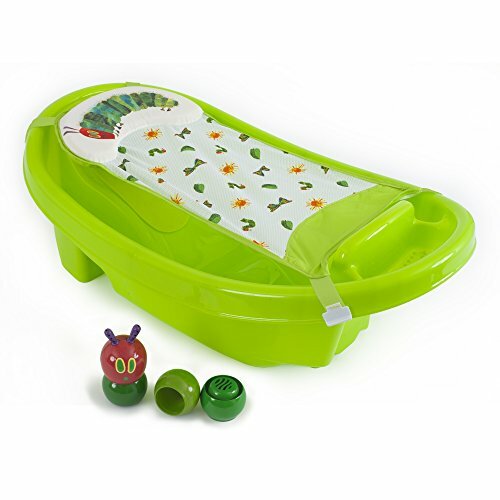 The stage 1 setup contains a soft sling for newborns; the stage 2 setup contains a reclined seat with non-slip foam and a bump or “baby stopper” for support; Stage 3 setup adds a seat insert into the tub that assists baby in sitting up; and finally, the stage 4 setup removes any pieces and is just simply a toddler-sized tub. This tub also contains a drain plug as well as a hook for easy storage or drying. In addition, two functional toys are included: a squeeze bottle and a whale scoop that can be used for both playing and rinsing. This tub does not have a lot of disadvantages but it does only come in one color scheme: white, blue, green and orange, which may not appeal to parents looking for a girly or gender-neutral option. 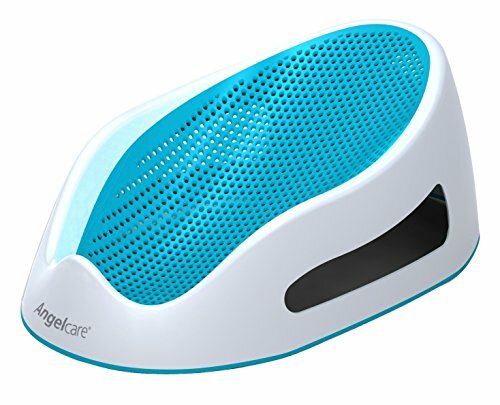 The Angelcare Bath Support is not really a tub but still holds a great place on this list for its outstanding convenience. It is more of a support that is placed in a bathtub or shower. This support is a sleek, one-piece design with a soft mesh backing to support baby comfortably during bath time. Because it is mesh and doesn’t hold water, it has no need for a drain and is also very lightweight. This bath support is also hygienic and made of mildew-resistant materials. It has a built-in hanging hook for easy storage and drying. The major disadvantages of this bath support are that it only comes in one size and recline position and as a result, is only suitable for babies 0-6 months with a 30 lb maximum weight limit. It comes in either blue and white or pink and white and does not offer any gender-neutral color options.